All Dogs we SELL are of SHOWQUALITY & CHAMPION Bloodline. Price is Rs 60,000 with KCI Paper & Micro - Chipped. No big statements. Only Quality Pups with ORIGINAL IMAGES & NOT like others. 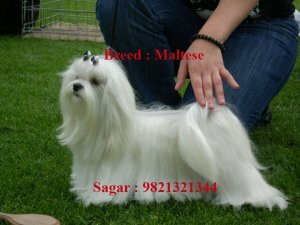 We are the only suppliers of Maltese Pups. We are BREEDERS and NOT TRADERS like others. We can Send Anywhere in India by Air. Only Genuine buyer can contact. Imported male & female shihtzu & maltese pups available contact 919892629541/ +919867934185/.